I’ve taken away a lot of valuable ideas from the Klingon summer program. I wanted to distill them into a really strong set of reflections, but I’ve found I haven’t been able do that because I am still trying to play and tease them and turn them into some sort of coherent philosophy which I can envision being enacted in my classrooms. So as opposed to most of the blog posts I tend to write, I’m going to go a bit theoretical, and ask for your help to come up with concrete ways to show these things happen. Just because you teach it, it doesn’t mean they learn it. Teaching is not the same as student learning. 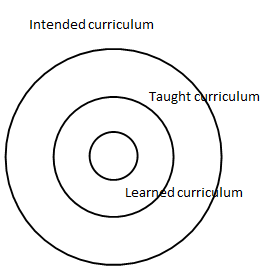 So the goal of teaching is to minimize the gap between the taught curriculum and the learned curriculum. And I thought I was doing that. I see myself as being cognizant of the mistakes that students tend to have in thinking, I work on developing their understanding rather than having them rely on algorithmic/procedural learning, I teach my classes at the pace of my students — and alter how far we get with the material based on how much time I see them needing. However, I have come to realize that I have been missing a gigantorific thing, because I’ve had some sort of blinders on. Especially egregious because this has been the central idea and nexus of the math teacher blogosphere for over a year now. I’m embarrassed to say: I don’t have any idea if I’m being successful at reducing the gap between the taught curriculum and the learned curriculum. But when it comes down to it, if my department head came to my class three-fourths of the way through, and froze the kids (okay… okay… no… she can’t do that… only I wield that power with my magic unicorn wand!) and asked me “what is the level of understanding of each kid in the class for the material you covered yesterday?” and “what is the level of understanding of each kid in the class for the material you covered today?” I wouldn’t be able to answer her with much confidence. I don’t have strong systems to formatively assess my kids understanding. Yes, there you have it. I said it. Now I need to find ways to do this. I am currently thinking of giving short quizzes at the start of every class and exit slips at the end of every class. I would like to pilot out clickers at my school. And I would like to come up with more intentional questioning which can get to the heart of whether a student understands a topic or not (meaning: I have these questions prepared before class and I can whip out when I’m ready to check their understanding). But more than anything, I’d love to hear ways you come up with ways to formatively assess kids understanding during a class or even outside of classtime. Big, small, thoughts on how to form questions that get deep to the heart of the subject matter, ways to figure out what every kid or what most kids know? Great post! Don’t despair, I think that we all feel like this most of the time! I would love to do small quizzes first and exit slips at end, but it takes so much time out of my 50 minutes! I am not willing to lose that everyday. And, I tried “exit slips”, but when they are rushing to their next class and my next class is coming in worlds collide and everyone gets stressed. I must not be doing this right! I’m new at this stuff — just finished my second year of teaching — but here are two ideas. — I leave a white board and eraser in each kid’s desk; they are supposed to (and usually do) carry a marker. If I ask them something like “does that make sense” and I get nods or other vaguely affirmative answers, I say “good; prove it” and ask them to do some work on the white board. Then I know who gets it, who is close to getting it, and who is just enjoying the ride. — Exit cards are almost always a failure for me because they require good time management, which I struggle with. I do a starter every day, though, wherein they take a slip as they walk in the door, complete it, and hand it in. Sometimes I look at these as they hand them in, so I can address misconceptions (or verify that they do in fact remember what they learned yesterday) immediately. I always have problems with the little slips of paper. They take time to create, copy, cut-up, hand out, collect, grade, comment, input in gradebook, and pass back. I wonder if your daily assessment can be directed at the class level — is there a sense that the class “gets it?” Is there a discussion? Can you pick student X to explain how to do Y? Great post! Have you considered the use of some kind of persona response system for formative assessments? This is exactly something I’ve been thinking about — whether it be miniwhiteboards, notecards, or something else that kids hold up. Loves that we’re on the same page! I just won a set of clickers from Turning Technologies. They give away 10 free sets every spring, so look for the application on their website. I have also used the response feature on the TI N-Spire Navigator (calculators +) and it is really useful for me seeing where students are and for them seeing where they are in relation to their classmates. The only downside is the time it takes for everyone to respond. I’m working on this. While I see the need to have systems to assess students during class, your post left me with the following question: Is it necessary to know where every students’ understanding is on any particular day? In other words, should I as the teacher expect to have a grasp of what each of my student understands every day? Gut check answer is “no” but this leads to the follow-up question: How often should I have this level of understanding about my students? This one I don’t have an answer for yet. Every week? Every standard covered? Every couple of standards? I have found this year that having to write narrative comments for our midterms allowed me to see what a strong level of understanding I actually gain about my students’ strengths and weaknesses without doing all of the cool systems others have mentioned. Of course it helps that the main focus of my class this past year was having conversations (both student2teacher & more often student2student) about math pretty much from start to finish. In my former large public school life I found that my Algebra 2 students LOVED the mini-whiteboards. Like I Speak Math I have no idea what made them so compelling; I just went with it. I have tried exit tickets, but didn’t use them every day–only when I had a piece of information that I needed to know by the end of class, or occasionally as a filler for the empty last-five-minutes of class that randomly pops up every so often. Create your own teaching technique, get to know your students strength, weakness and what motivates them. Create time to tackle their weakness individually or collectively.